It sounds easy enough. Set up a camera, a mic, and ask someone a bunch of questions. Anyone can do it, right? Assuming you’ve got a handle on the technical side, then… sure anyone can do it. The question is… how well? An editor will be taking bits and pieces from the interview to build a meaningful story. The quality of those bits and pieces, and thus the quality of the video, is greatly dependent on the skill of the person conducting the interview. Granted, some of these skills are inherent but many are learned. In the next few posts I’ll review some basic tips that can help anyone improve their interview techniques. 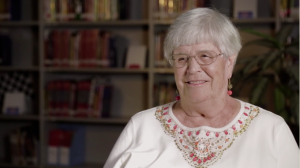 Elizabeth “Pete” Johnston reflects on a career in education. It all starts with making your subject comfortable and finding some small way to connect. Most people are not at home in front of a camera. The lights, microphone, camera and crew can be intimidating. But, before you can help your subject relax… you have to make sure you are relaxed. Here is where we can all learn a little something from the Dog Whisperer, Ceasar Milan. Project calm assertive energy and it will put your interviewee (and any dogs in the area) at ease. So smile… make a small joke. Chill. Now that you’ve broken the tension it’s time to connect. Casual conversation, unrelated to the interview topic, can help you and your interviewee prepare for the moment the camera rolls. Do you have anything in common? Take in your environment… an item in a home or even a t-shirt they are wearing. “Did you do the bridge run? I did it three years ago and it was a madhouse.” Keep it light…. keep it easy… keep it real..connect.